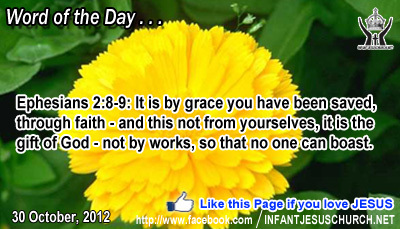 Ephesians 2:8-9: It is by grace you have been saved, through faith - and this not from yourselves, it is the gift of God - not by works, so that no one can boast. Heavenly Father, we can never thank you enough for sending Jesus and paying the debt for our sin. May we never presume on your grace or take the cost of your gift lightly. At the same time, Father, we want to live confidently, knowing that our salvation is not dependent on our errors but upon your grace. Because of such a plentiful gift, we want to live for you today in a way that reproduces the joy we have at receiving such an overwhelming gift. In the name of Infant Jesus, we pray. Amen. Leaven is powerful mediator of change. A piece of dough left to it remains just what it is, a lump of dough. But when the leaven is mixed to it a transformation takes place which generates rich and healthy bread when heated - the staple of life for humans. The kingdom of God bring into being a transformation in those who receive the new life which Jesus Christ offers. When we yield to Jesus Christ, our lives are changed by the power of the Holy Spirit who dwells in us. Paul the Apostle says, "we have this wealth in earthen vessels, to show that the inspiring power be in the right place to God and not to us". Do we believe in the changing power of the Holy Spirit? Loving Infant Jesus, fill us with your Holy Spirit and transform us into the Christ-like godliness you desire. Increase our zeal for your kingdom and inspire in us a holy desire to live for your greater glory.